CAUGHT ON VIDEO: Dog Trapped In Submerged Truck Bed, But You’ll Be Cheering By The End! When we were younger, we probably remember seeing lots of big dogs riding around loose in the back of pickup trucks. Although the owner might think the dog would enjoy it, this is very unsafe and irresponsible. If anything were to happen, the dog has no way to help themselves brace for impact or escape without seriously harming themselves. And if you love your dog, why would you ever want to put them in harm’s way? 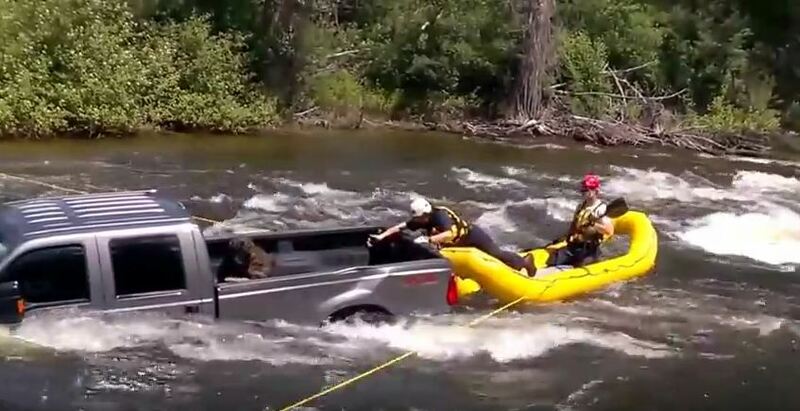 In Winthrop, WA, a person driving a truck had a terrible accident, sending his car over into the rolling rapids–with his poor riding in the back bed. Thankfully rescue crews responded to the call for help–just in time. When they arrived, they could see that this dog didn’t have long to live, the current strong and quickly submerging the vehicle. Crowds grew in numbers as onlookers couldn’t turn away to watch this amazing rescue. Just see for yourself! We are so glad that this dog made it out alive, but this should serve as reminder to all that you never know what could happen if your dog is riding around in the back of a pickup truck. Pass this along to help keep dogs safe!